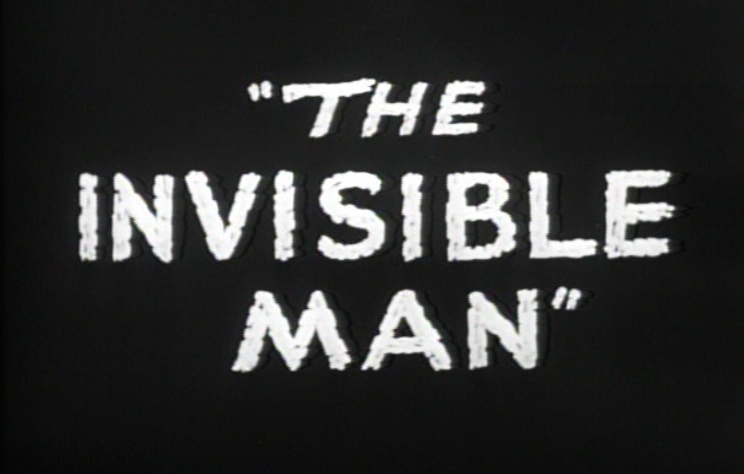 The Horror Digest: The Invisible Man: Why You Should Always Pick Invisibility over Flying. The Invisible Man: Why You Should Always Pick Invisibility over Flying. I'm sure we've all been asked this question numerous times, whether at sleepovers, in school, first dates whatever. Which super power would like to have? Or in some less accepting crowds where the question is chopped for brevity--Would you rather have the superpower to be invisible or to fly? The answer was always easy for me, as the idea of being able to stand unseen in the room of my elementary school crush sounded far more appealing than flying ever would. And even now when the idea of stalking people is far from my mind--the concept of being invisible just sounds nice. Dr. Jack Griffin would beg to differ I'm sure, as I suppose anyone would who does not have the ability to turn on and off invisibility as easily as a light switch would. No, a side effect of madness doesn't seem very exciting either I might add.... no, no, being invisible Dr. Jack Griffin style is not a highly sought after super power. 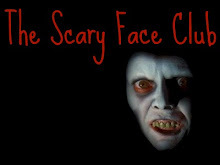 It is at best used for comedic relief and at its worst used for indeterminably horrific consequences. I should also point out that being called an invisible man is not a highly sought after term, as 98 degrees explains in this highly informative video. Ah yes what else can we learn from the horrific consequences of a science experiment gone wrong? 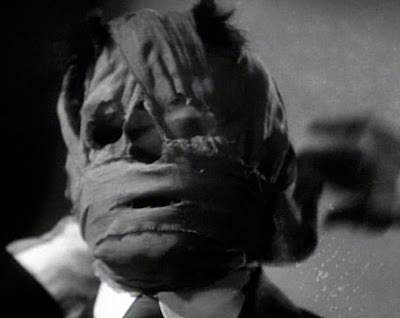 Although not necessarily one of the better known Universal "monsters", The Invisible Man comes as quite a surprise in terms of special effects and laughter in the face of uncertainty. Way before its time, the effect of Dr. Griffin with only clothes on, is pretty impressive for the 1930s. Even minor stunts like sending a toy train off a cliff look pretty darn realistic! Yes, I basically thought it was a real train, laugh it up. 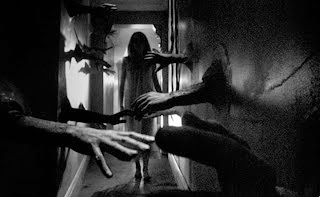 In a time before green screens and CGI, the effect achieved so much more than even some films today and achieved it using simple means. And the best part is---it's believable! Well at least to me and my easily satisfied mind. I also laughed. A LOT. 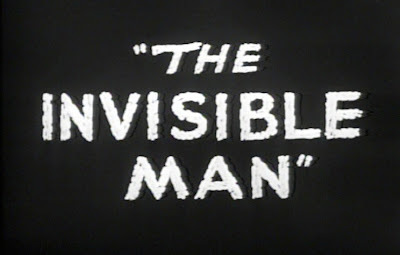 Who knew an invisible man would be a great jumping off point for some honest to good slapstick comedy? Well alright, I guess it's a fairly obvious move. Having a room full of men, weapons at the ready and then to have the assailant go around and throw people's hats off, pull their legs out from under them and pants them? (did he ever pants anybody? Well he should have). Yeah, I guess that does scream slapstick opportunity. I just could not stop laughing once the invisible man went off the deep end and turned "mad" and started reeking serious havoc on the poor town. And to top it all off, to have the deep and invigorating voice of Claude Rains behind all of it? The way that he says those nursery rhymes well giving someone a good kick in the behind is almost too classic for words. Perhaps the one great fault-- is that the real tragedy is almost pushed to the side. 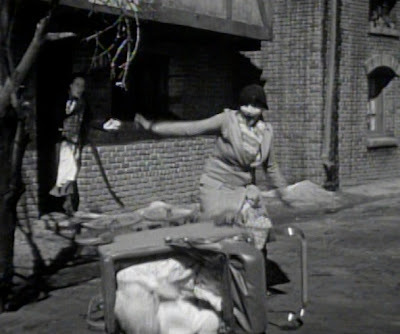 We see the invisible man engage in a quick scene with his beloved, whom he apparently loves more than anything but then his "madness" and all the funny that happens seems to overshadow everything. Can I really believe that the invisible man loves Flora and further more believe that they are engaged? And since when did going mad mean that you are hilarious? Not that I'm complaining about it because it was quite hysterical and entertaining but to have a side effect of the drug be madness is kind of odd. In fact I don't believe that is an original part of the story. It much rather seems to me that during the time of Universal's out pour of horror, there was a lot of explaining going on. People didn't like that there was such a thing as unexplainable emotion. You couldn't just be struggling with your identity you had to have lycanthropy, you couldn't just vent about being invisible and no one caring, you had to be suffering dementia as a side effect of monocane. See? It's all very interesting, but I much prefer thinking that Dr. Jack Griffin was merely frustrated and found his entire situation to be "funny" in a ridiculous kind of way, rather than a "side effect". Yes perhaps he was "mad" but only because he realized that he would never be seen again. I still maintain that he kept his sanity though. 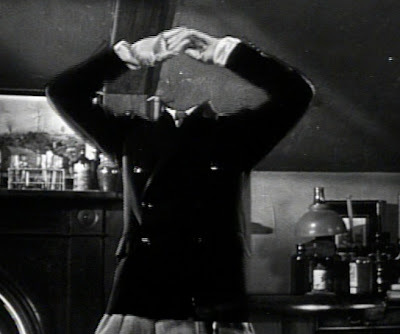 Well in any case, the Invisible Man is still quite entertaining and although I never got a real sense of fear or horror while watching, I did enjoy the first glimpse we get of the invisible man in the tavern. He's quite ominous isn't he? I suppose we are meant to find terror in the fact that this man is capable of anything--throwing people's hats off, robbing banks, and throwing people off cliffs. Yes, I suppose that would be terrifying to not see someone who is capable of murder but people were treating him badly! I would be nice to him and leave him alone when he told me to. I would also NOT scream all the time like that crazy dingbat woman. I much more often found myself on the side of Dr. Griffin than anyone else. 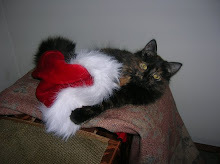 Although I guess that is what tends to happen with this Universal pics. 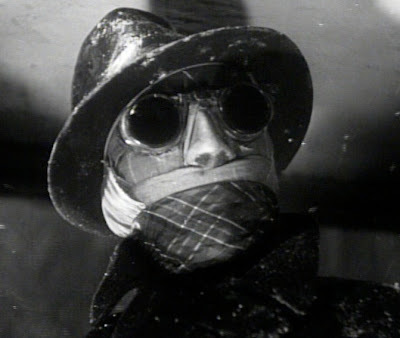 Overall, The Invisible Man may lack a true sense of fear, but its effects and the comedic undertones are more than enough to keep you satisfied. P.S. YES to flipping over that baby carriage. Genius. One thing I NEVER see touched on is how the invisible man can see? If he were truly invisible, his retinas would be transparent and I stead of reflecting light into the rods and cones it would pass through. 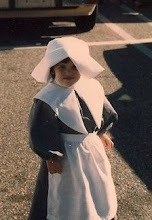 Where is the fun in being invisible if you're blind? Ha! I am not so scientifically astute so I did not think of such a thing....but there would be no fun in that you are right! There's a more positive take on The Invisible Man by Queen. Definitely one of THE most underrated of the Universal monsters (right next The Creature). I think David Skal made good mention of him his his book The Monster Show, comparing his "mythology" to that of a ghost which is interesting. I think a smart director could really take that and run with it to creeptastic results. BTW - Have you ever seen Memoirs of an Invisible Man (1992)? It's also a great interpretation of the original story and understands some of the comedy inherent to the situation. Can't beat vintage Chevy Chase either. I LOVE this movie! I could sit and watch... uh, listen... to Claude Rains all day. That rich voice of his was enough to carry the whole movie. The humor is really spot-on and you can't help but laugh most the time. Especially those dancing pants! I loved how you proposed that Jack was actually sane the entire time. You're especially correct in saying that films tend to have to explain everything. It's seen even in today's movies. Really great stuff. Keep up the great work! The special effects are indeed mighty impressive, especially for the time. I've always been wowed by them--I think there might have been a primitive version of what's now a green screen, not sure. Going in, a lot of people don't realize that this flick is indeed a dark comedy (in part due to the brilliantly bizarre Una O'Connor, whom you mentioned, and who also serves the same function in Bride of Frankenstein). I also love that you have Claude Rains, who would later become a mondo Hollywood star, getting his start in a Universal horror movie. I think that's why he returned to Universal to do The Wolf Man almost a decade later, even though he was already a big name by then. Ha! Wow I did miss that B-sol! Fascinating....!